Northern Illinois Daffodil Society - Council of Rockford Gardeners, Inc. The Northern Illinois Daffodil Society is associated with the Midwest Daffodil Society and the American Daffodil Society. Each April the Midwest Daffodil Society hosts an American Daffodil Society approved Daffodil Show at the Chicago Botanic Garden in Glencoe, IL. This show is typically held in April where growers and flower designers are invited to exhibit. Daffodils are the flowers symbolizing friendship and are one of the most popular flowers due to their unmatched beauty. 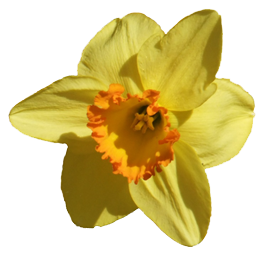 Daffodil flowers have a trumpet shaped structure set against a star-shaped background. Often the trumpet is in a contrasting color from the background. The name Daffodils includes the cluster-flowered yellow Jonquils and the White Narcissi. Look for information about the society, results of past daffodil shows, and information about the 2019 Daffodil Show at www.chicagobotanic.org/calendar/event/midwest_daffodil_society_show. The Northern Illinois Daffodil Society Bulb Exchange will be in September this year. Date to be determined.